This may or may not bear out as anything accurate to where Damon Lindelof and Carlton Cuse are taking Lost, now in its final season. But there's a zillion other theories out there, might as well add my own to the madcap mix! It hit me like a mallet between the eyes late last night, during the 22 hours that the electricity was out from this winter storm. The first big clue was the title of the Season 6 premiere episode: "LA X". ...but as we saw in "LA X", following whatever it was that Juliet did at the Swan site in 1977, an alternate reality was created: one where Oceanic 815 landed in Los Angeles on September 22, 2004. And this reality is running co-terminous with the "main" timeline where Oceanic 815 still crashed on the Island. Well, using an "X" for a storyline involving multiple realities isn't unprecedented. Back in the late Nineties comic book artist Alex Ross pitched an idea to Marvel Comics: basically a dystopian Marvel future like what Ross did with Kingdom Come for DC Comics a few years earlier. 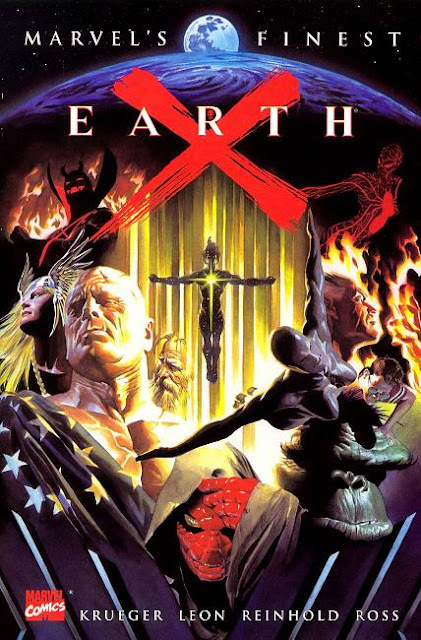 The result was Earth X: what is, in my estimation a very under-rated alternate mythology of the Marvel Universe. Earth X was followed up by Universe X and Paradise X. And where this is germane to our discussion of Lost is that it becomes revealed during the course of the Earth X trilogy that longtime Marvel supervillain Mephisto had been plotting and scheming since the dawn of time to create alternate realities! Why, you ask? Because Mephisto sincerely thought that he was the devil of Judeo-Christian teaching and he was making all of these alternate timelines so that he could flee into them, in a bid to escape what he believed would be God's final judgment at the end of time. By the end of Paradise X, Mephisto was killed at last and his machinations stopped for good. And a "Heaven" of sorts wound up created that would forevermore keep Earth and its realm from being manipulated by cosmic entities like the Celestials and their sort. The Island is, among many other things, a prison for the Dark Entity (what we have seen all this time as the Smoke Monster, various incarnations of characters and now appearing as John Locke). And it's a prison because the Dark Entity is, if not the Devil himself, then someone representing the very nature of evil. And the Dark Entity has been stuck on the Island all this time, doing what Satan does in accusing humanity (namely to Jacob, who is perhaps the embodiment of the Island and its power, as we saw hinted at by the spring in "LA X"). As with any other prisoner, the Dark Entity wants to escape. But he can't simply leave like a normal person could. There are "rules" in effect: rules which have only begun to be hinted at to us. The Dark Entity cannot escape by breaking the rules. Outright killing Jacob would have broken the rules too... so the Dark Entity has had to find a loophole. 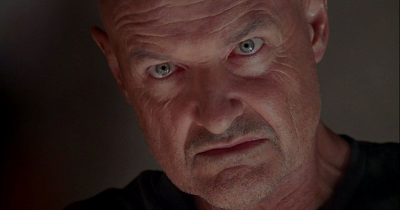 "Salvation" for the Dark Entity came in the form of John Locke: ironically the one human who wanted to remain on the Island. But the biggest irony of all came as Benjamin Linus, who assumed that he was the greatest manipulator on the Island. Linus had no idea at all that he himself was being manipulated by someone even more powerful. In the end, the Dark Entity, posing as John Locke and thus the leader of the Island's people, entered the statue of Tawaret to confront Jacob. He still couldn't kill Jacob of course... but as Benjamin Linus was still the de facto tapped leader of the Island, he possessed the power and authority to kill Jacob if he wanted to. Of course as we know, Ben was motivated to do so by the Dark Entity, and he slew Jacob. Why? For what purpose was all of this? Because the Dark Entity just wants "to go home". What "home" means, hasn't been made clear yet. It could mean that he wants to escape to somewhere in the outside world. Or it could mean escaping into someplace beyond our realm of understanding. And it could be that he wants to escape into an entirely new universe. Like, the one that was just created by the timeline in which Oceanic 815 didn't crash. This is no longer a fight for the Island. Or even for the Earth. This might well be turning into a struggle for all of reality. Little does the Dark Entity realize though, that Jacob isn't out of the game quite yet. He's still able to communicate via Hurley. And Jacob obviously knew what was coming down given the contents of the guitar case that he gave Hurley before directing him to take the Ajira 316 flight. Also, why did Jacob seem so nonchalant and accepting of his fate? Unless it was all part of some greater plot by Jacob. Perhaps to put an end to the Dark Entity once and for all? One of the bigger elements of the Earth X trilogy was Mar-Vell's quest to end the rule of Death. And in Death's realm it seemed that Mar-Vell had fallen and the war had been lost. Mephisto was literally gloating over Mar-Vell's body. And then Mar-Vell revived and manipulated Thanos (no small manipulator himself!) into slaying Death: the entity that Thanos had sought to court as his lover. I don't see why Jacob couldn't be playing a similar "long con" against his ages-old nemesis in the tale of Lost. This sixth and final season of Lost might be coming down to an epic battle between good and evil, with people in two universes deciding the outcome. There y'all have it: my own personal Lost theory. I think I need to start watching LOST again.